UPDATED: Thu., July 5, 2018, 4:39 p.m.
Around the Northwest League and Texas Rangers affiliates for Thursday’s games. 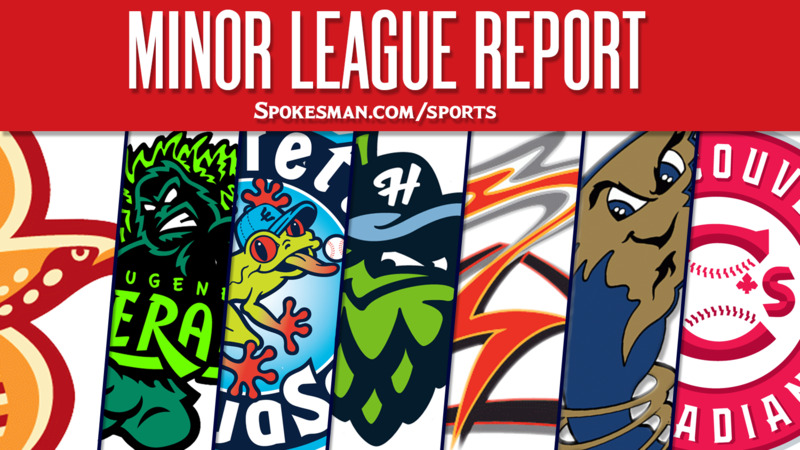 Hillsboro 4, Spokane 3: Tre Holmes homered and the Hops (13-6) topped the visiting Indians (6-13). The Indians (6-13) are 0-8 so far this season on the road. Curtis Terry hits his league-leading eighth home run of the season. Indians starter Hans Crouse (1-1) struck out seven over 5.1 innings, but allowed four runs on four hits – including a home run, one walk, three wild pitches, a passed ball and three stolen bases against. Everett 1, Eugene 0: Nick Rodriguez homered in the fifth inning and the visiting AquaSox (11-8) got past the Emeralds (7-12). Jheyson Caraballo (3-0) struck out four in six shutout innings and allowed seven hits and one walk. Boise 7, Tri-City 3: Jeff Bohling homered twice and drove in three and the visiting Hawks (10-9) beat the Dust Devils (9-10). Daniel Jipping added a two-run homer for Boise. Salem-Keizer 5, Vancouver 4: Jose Layer singled home Nico Giarratano in the ninth inning and the visiting Volcanoes (12-7) edged the Canadians (8-11). David Villar and Wander Franco both homered for S-K. Round Rock 8, Colorado Springs 4: Willie Calhoun hit a three-run homer, his seventh of the season, and the Express (39-45) beat the visiting Sky Sox (46-37). Scott Heineman went 4 for 4 and scored twice while Nick Noonan added a solo home run. Tulsa 9, Frisco 7: DJ Peters went 3 for 5 with a two-run home run and the visiting Drillers (41-39) defeated the RoughRiders (32-50). Preston Beck went 3 for 5 with a grand slam in the ninth inning and Juremi Profar added a solo shot for Frisco. Salem 4, Down East 0: Darwinzon Hernandez struck out seven over six innings, allowing five hits and two walks, and the visiting Red Sox (38-42) shut out the Wood Ducks (41-42). Bobby Dalbec went 2 for 4 with a solo homer and three RBIs. Hickory 5, Greensboro 1: Noah Bremer (2-2) struck out six over six innings and allowed one run on four hits and two walks and the Crawdads (37-44) beat the visiting Grasshoppers (40-41). Preston Scott hit a two-run home run and Tyler Ratliff added a solo shot. Published: July 4, 2018, 5:55 a.m. Updated: July 5, 2018, 4:39 p.m.